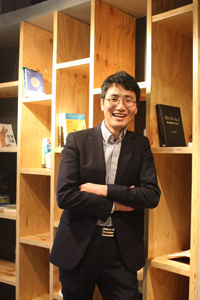 Max Han, the 29-year-old CEO of Wisdome, a lecturer agency, says people should have equal opportunities to learn from experts and other qualified people. “It is not fair you cannot learn from someone mainly because of your personal background. I wanted to address that inequality by making a platform that connects learners to lecturers,” Han said. Wisdome, launched in April 2012, makes money by introducing learners to lecturers. When people want to lecture about their expertise, they sign up on the website and provide the necessary information such as what they want to teach, where and at what price. The firm then receives commission from the lectures. As of November, Han’s business has put on 1,988 lectures for 14,461 people. It has some 750 lecturers throughout the nation, a figure that increases every day. What inspired Han to launch this business is the tough environment in which he grew up. Despite his tough childhood, he was able to complete his education at Yonsei University, one of the most prestigious universities in Korea. Then, he got a job at Daewoo International. The firm plans to create a database of its lecturers and actively expand the business next year.